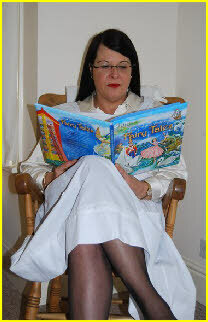 Hello, I’m Nanny Lucinda and I welcome adult babies and diaper lovers to my well equipped and discreet ABDL nursery in rural Limousin, France. Here, babies can stay for as long as they like and be looked after by me; a strict but caring mother figure. They can fully regress back to infancy or toddler age and immerse themselves in a special world where good babies are rewarded with loving cuddles and naughty ones are punished with bare bottom smacks. Should you choose to visit me, your personal needs will be listened to and your time will be individually tailored to you. You can be treated as a baby, toddler, small boy, small girl or simply a lover of nappies. On arrival you will be stripped of the ‘adult you’ and transformed into a ‘little one’, as I help you into some clothing more suitable for a baby's needs from my wide selection of frilly dresses, onesies, plastic pants, mittens, bootees, bonnets, wigs and nappies. All lengths of stay are possible, with accommodation available for overnight and extended stays, so why not come and be a baby with me?